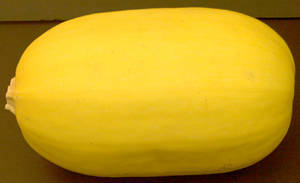 So every fall I forget about spaghetti squash, and then I remember and its a wonderful present for my mouth. Luckily this fall my friend Erin was eating a lovely creation she made of spaghetti squash for lunch one day in the kitchen at work so I then blatantly copied her to make my own creation. Spaghetti squash is excellent because it is like eating spaghetti, but healthier (even when you toss it with a whole lot of mascarpone like I did). To make it properly get yourself a REAL big knife, cut the thing in half and then place it in a baking dish with about 1/2 inch of water. Then shove the whole thing in the over for 45ish minutes (don’t mind if you miss the timer going off while watching 30 Rock and it cooks longer, it will still be ok). After those 45 minutes flip the halves over and cook for another 15ish minutes. From there you can top it with whatever you want, quite like its carby namesake. I choose to toss it with the above mentioned mascarpone (if you have never eaten it then do it now. No seriously, now, I’ll drink this delicious glass of Malbec I have while I wait). I then tossed it with sauteed green beans, Portobello mushrooms and a whole bunch of Parmesan cheese. You could also toss it with my go to lemon cream sauce (which was the plan till I discovered the cream went bed), for that you combine equal parts white wine and cream, the juice and zest of a lemon or two and then bring it to a boil and then pour over pasta and eat. The moral of today’s little story is that; a)spaghetti squash is good, b) mascarpone is good, c) combining them is best!